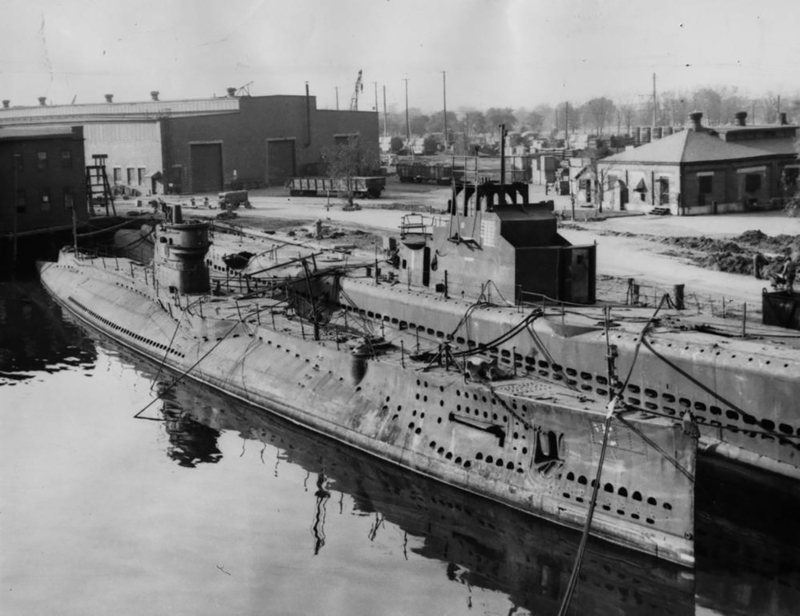 S-4 Class Submarine (Government-type): Laid down, 13 December 1917, at Lake Torpedo Boat Co., Bridgeport, CT.; Launched, 8 March 1920; Commissioned, USS S-15 (SS-120), 15 January 1921; Decommissioned, 26 April 1935, at Philadelphia Navy Yard, Philadelphia, PA.; Laid up in the Reserve Fleet; Recommissioned, 3 January 1941; Decommissioned 11 June 1946, and struck from the Naval Register, 3 July 1946, at Philadelphia Navy Yard, Philadelphia, PA.; Final Disposition, sold for scrapping, 4 December 1946, to Potomac Shipwrecking Co., MD. 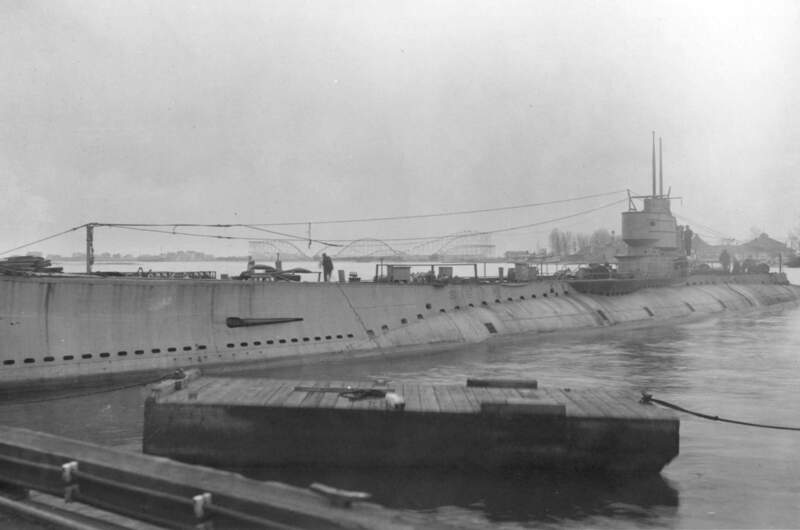 191k S-15 (SS-120), dockside at Bridgeport, CT. 3 January 1921, 12 days before her commissioning, 15 January. USN photo 19-N-6478, courtesy of Scott Koen & ussnewyork.com. 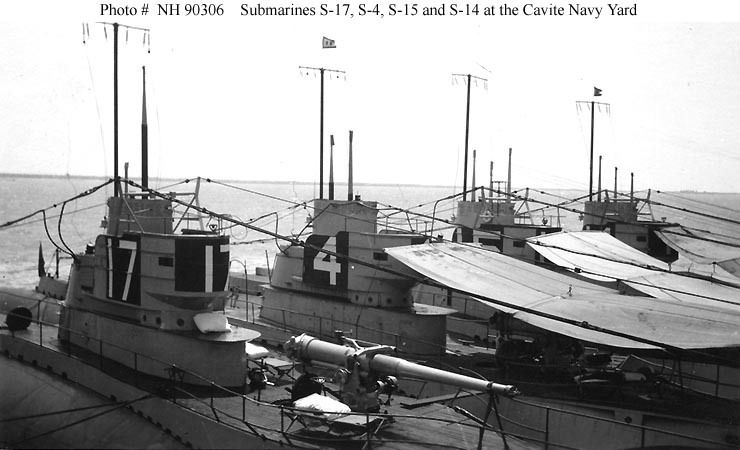 S-14 (SS-119). U.S. Naval Historical Center Photograph # NH 90306. Courtesy of Captain A.L. Prosser, USN (Retired), 1979. 544k Inscription on bottom of the photo reads:"Overhaul Period, Mare Island CA. 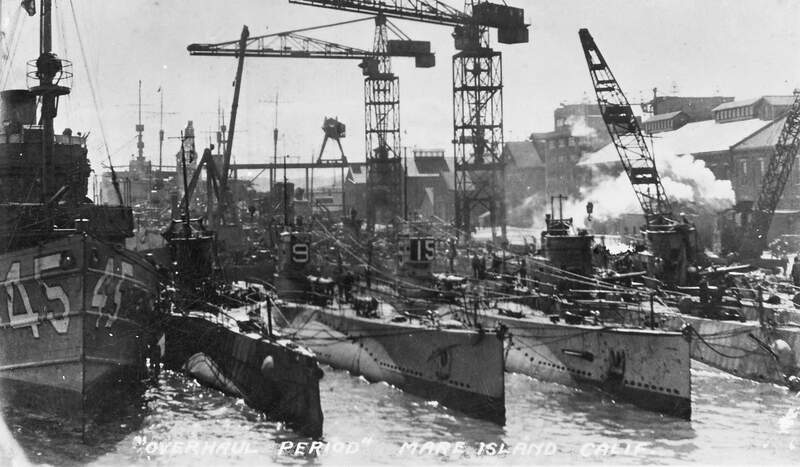 Dock side view at Mare Island in 1929; the Ortolan (AM-45) and five of her charges, of which only two boats are identifiable: the S-9 (SS-114) & S-15 (SS-120). USN photo courtesy of Angie Mattke. 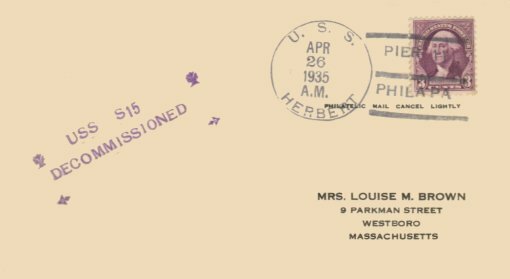 11k Commemorative post mark issued on the occasion S-15's (SS-120) first decommissioning, 26 April 1935, at Philadelphia Navy Yard, Philadelphia, PA. Photo & text courtesy of Jack Treutle (of blessed memory). 81k Captain John P. Cromwell, USN photographed circa 1943. He commanded S-15 (SS-120) in 1936-1937, as a Lieutenant. He was lost with Sculpin (SS-191) on 19 November 1943 and was posthumously awarded the Medal of Honor for his actions at that time. "For conspicuous gallantry and intrepidity at the risk of his life above and beyond the call of duty as Commander of a Submarine Coordinated Attack Group with Flag in the Sculpin, during the Ninth War Patrol of that vessel in enemy-controlled waters off Truk Island, November 19, 1943. 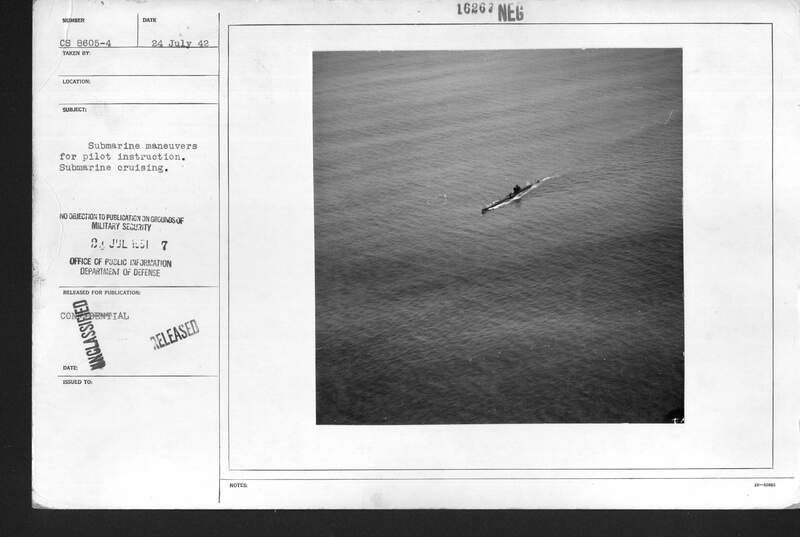 Undertaking this patrol prior to the launching of our first large-scale offensive in the Pacific, Captain Cromwell, alone of the entire Task Group, possessed secret intelligence information of our submarine strategy and tactics, scheduled Fleet movements and specific attack plans. 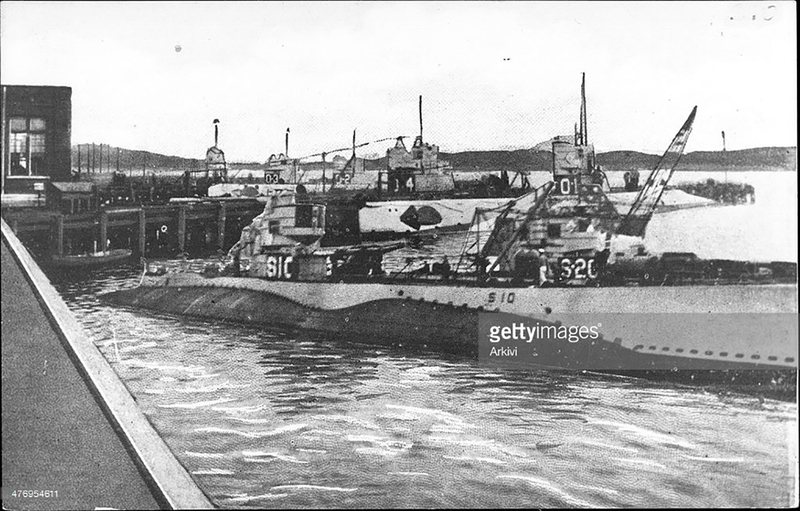 Constantly vigilant and precise in carrying out his secret orders, he moved his underseas flotilla inexorably forward despite savage opposition and established a line of submarines to southeastward of the main Japanese stronghold at Truk. Cool and undaunted as the submarine, rocked and battered by Japanese depth-charges, sustained terrific battle damage and sank to an excessive depth, he authorized the Sculpin to surface and engage the enemy in a gun-fight, thereby providing an opportunity for the crew to abandon ship. Determined to sacrifice himself rather than risk capture and subsequent danger of revealing plans under Japanese torture or use of drugs, he stoically remained aboard the mortally wounded vessel as she plunged to her death. Preserving the security of his mission at the cost of his own life, he had served his country as he had served the Navy, with deep integrity and an uncompromising devotion to duty. His great moral courage in the face of certain death adds new luster to the traditions of the United States Naval Service. He gallantly gave his life for his country." 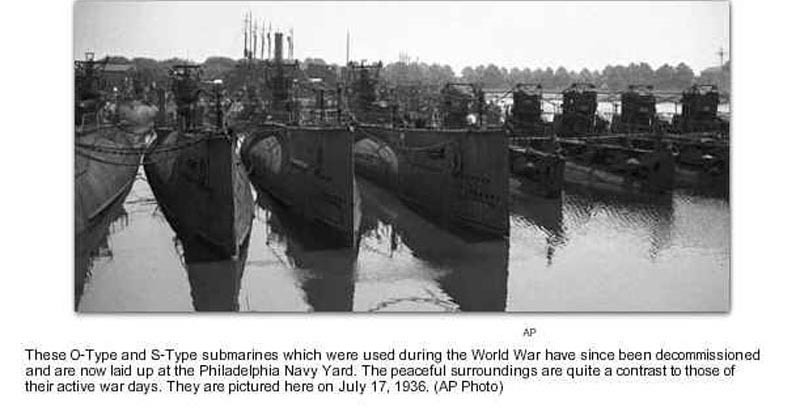 This image was published in the book "United States Submarine Losses in World War II". Medal of Honor citation for Captain John P. Cromwell (as printed in the official publication "Medal of Honor, 1861-1949, The Navy", page 170): USN photo # NH 51733, from the collections of the US Naval Historical Center. The O boats: O-1 (SS-62), O-2 (SS-63), O-3 (SS-64), O-6 (SS-67), O-7 (SS-68), O-8 (SS-69), O-9 (SS-70),O-10 (SS-71). 472k "For sale: one slightly used submarine", 19 November 1946.